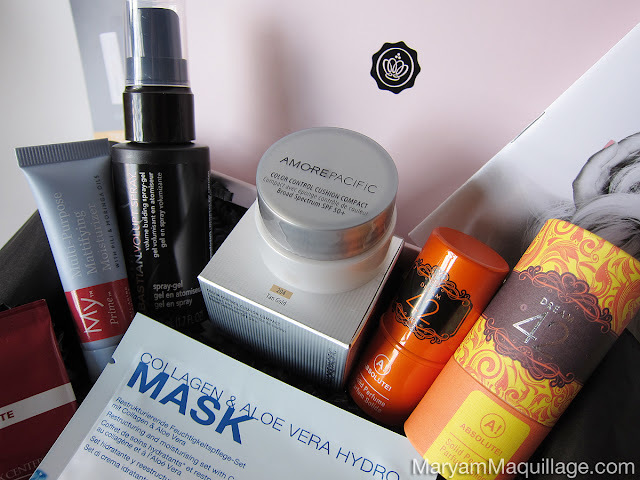 Maryam Maquillage: Happy Birthday Glossybox + GIVEAWAY!!! May's Glossybox features a special, celebratory collection embracing its past and future, with a fun salute to New York City -- Glossybox US' hometown -- and mine! Cheers!! One of my favorite skin care lines and my top product in this month's box. This cushion compact contains broad-spectrum SPF to combat free radicals, deep hydration for nourished skin, and complete, photo-ready coverage (as seen in my pic!) -- all in one lightweight, portable compact. The product goes on slightly tacky, but dries quickly and results in flawless, natural coverage. The shade I received, Tan Gold, matches my skin tone perfectly. I swear, sometimes I think Glossybox knows me better than I know myself! This product is amazing, does exactly what it says, and is perfect for touch-ups and traveling. Highly recommended -- Thanks Glossybox!! Y'all know I love me some hydro masks, so this product really excited me! Truth be told, my skin has been atrocious lately -- I've been doing some traveling, so the lack of sleep and long hours have definitely taken their toll. Thankfully, this collagen boosting mask has all the necessary properties to revive tired, stressed skin and bring it back to norm. Using this product just once, right before bedtime, made my skin look and feel a million times better the next morning, giving it suppleness, brightness and much-needed balance. 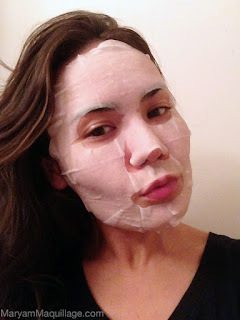 Plus, it's a cloth mask that clings to the skin without any major bubbling or peeling, so it's easy to wear and doesn't take you away from your activities. Another highly recommended fave that truly works! This solid perfume hails from my home town -- New York Citaaay and embodies its passion and spirit with a dreamy, seductive scent that's fit for a City-Kitty. I'm in love with the über cute vintage-inspired packaging, that also features a fun NYC fact on each box. Did you know? : There are over 300 hotels within 5 blocks of 42nd to 47th Streets! My city never sleeps! This volume building spray activates the hair in two phases, combining full volume and sensual softness. I used this spray to amplify my hair into a full high bun (as seen in the pic below), and it can also be used as a blow dry serum for extra volume. A primer and moisturizer in one that actually works? Sold! This product is terrific and mattifies / balances my combination skin brilliantly. I'll be using this every day until it runs out and then I'll be getting myself a full size. Thanks Glossybox! The Exfoliate is great for manis / pedis and polishes the skin without any harsh abrasives. The Slow It Down Body Wash prevents ingrown hair and deters bumps and blemishes while hydrating the skin. Glossybox has teamed up with Caseable to offer my followers a chance to win $80 towards a custom-designed case for your iPhone, iPad, iPad mini (shown) or a sleeve for your MacBook, as well as cases or sleeves for non-Apple products. My iPad mini case was custom-designed by my mom, but you can choose any design / logo / pattern that your heart desires. How cool is that?!!! Plus, there will be THREE winners chosen!! TO ENTER: Follow @caseable @glossybox_us & @mamadramanyc on Twitter. Must be a US resident. Multiple entries OK. I've wanted to subscribe to this for awhile but have been holding out, I think it might be time to just go ahead and try it out because I am loving this box! Thank you for the really awesome giveaway. hello my dear!!! its been so long and i'm so happy to pass by.. you look great as always!!!! i hope i can join this giveaway... can I???? take care my dear and keep in touch!!! 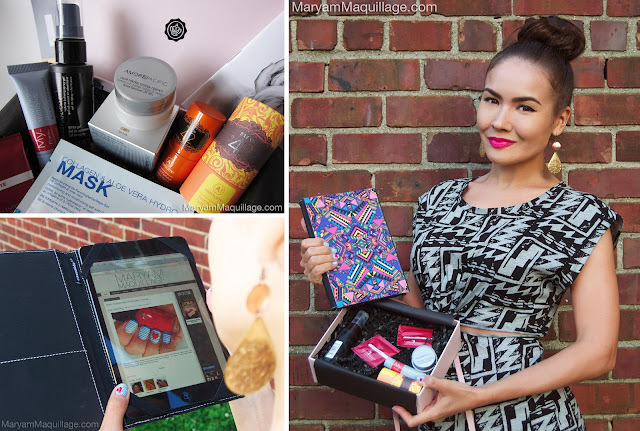 Maryam, Thanks for this super awesome feature including caseable. Absolutely love your mom's design for your iPad mini case. We're sure it will be a conversation starter where ever you take it.